For a charity event on Monday I needed to make 19 flower arrangements on a tiny...no miniscule budget. The colors were already chosen so I stuck with all one color of five different kinds of flowers. I was hoping the roses were a little more open...but I did not buy them a few days ahead as I normally would so they would have time to open a bit more. For the vessel I looked at Micheal's and Walmart, but I knew all along what I needed was at Ikea. I love these little drink glasses and they are only $2. I have them in gold and white too. I use them for their intended purpose, but also for votives and flowers. 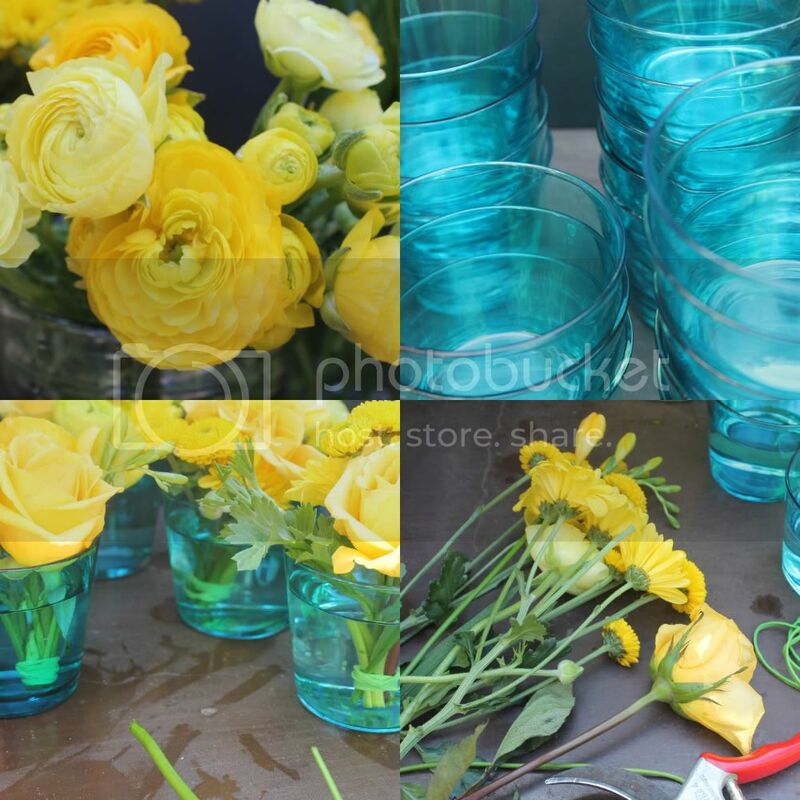 I arranged the flowers and bound them with a rubber band and cut them very short so they fit nicely in the glass. I thought I would leave them just with the green rubberband, but then decided for a more finished look in the glass and wrapped raffia around the rubber band. Eiffel Tower scissors from Lynne at Dreams on 34th street....thank you! While purchasing the roses at Costco I found these strawberry flat boxes. Perfect to transport them and they were even the perfect color...love that. All these flowers in the house and no party at Jane's! But as luck would have it, her post has the most beautiful flowers...go check it out here. Hey Annie, these flower arrangements are so pretty! I And the light blue vases create an amazing contrast! Well, this just goes to show that tiny miracles are possible!! 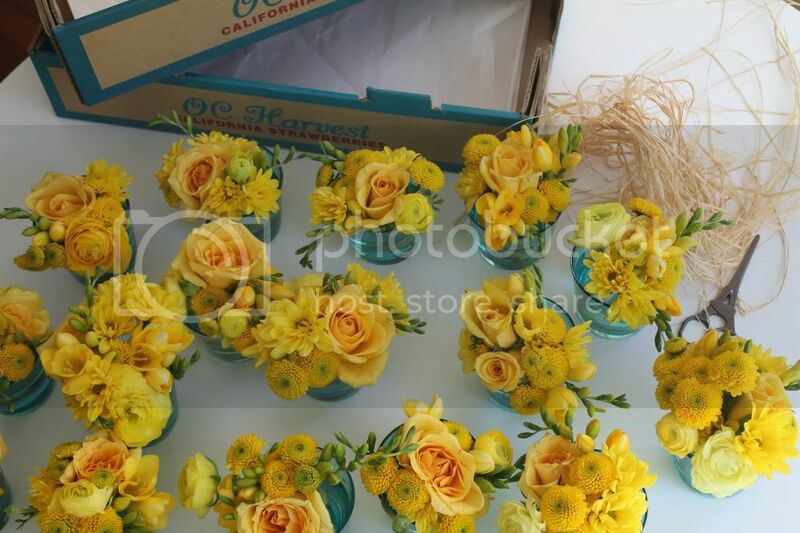 Your flower arrangements are so very pretty, the yellow and blue complementing each other perfectly. And, the different forms and textures of the flowers make for a very pleasing display. Lovely! Simple & lovely as always Annie! I love simple floral centerpieces. They look adorable in the strawberry boxes. Wonder how they knew the perfect person to call for the arrangements? Beautiful job, fresh, springy and the raffia is such a nice touch! I love that even the boxes make you smile! Annie, you are an absolute genius. I would love to go on a course to learn these lost feminine arts. Absolutely beautiful!!!! You've done such a lovely job here. Love the colors and combinations of flowers. Love the strawberry boxes too! Genius. The raffia wrapped around the rubber band was the perfect idea! I had to laugh about the perfectly matching strawberry boxes - the details that we as woman love!! I would have been all over that too! Beautiful...I like the raffia idea as well. I am known for using mason jars for all sorts of flower arrangements and they are fun to give away too! Simple and beautiful! Love the glasses...lovely color combination! So simple and beautiful! The raffia is such a nice touch. I am really fond of Ikea too, they always have interesting things. I have never seen raffia wrapped around flowers and then put in the vase. What a great idea! I love the way that looks! Beautiful pictures and you did amazing with a next to nothing budget! SO gorgeous Annie! Something about this color combination is just so appealing. Great idea to mix all the different types of flowers in one color. Loving the glasses too. All so simple, but together perfect! Lovely bouquets...make great party favors, too. 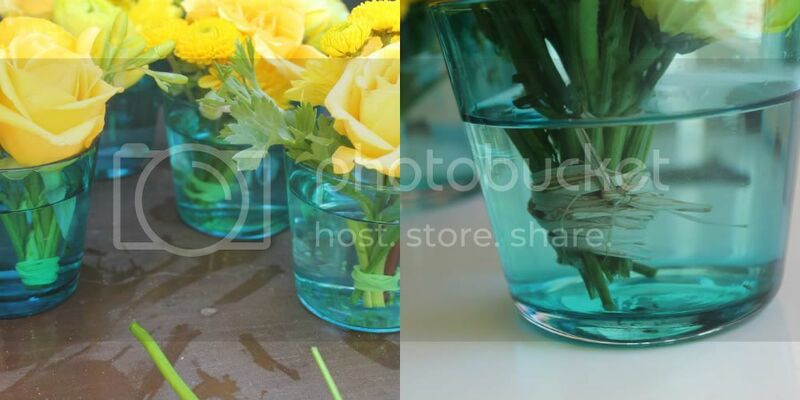 Love that you use drinking glasses as vases and the aqua with the yellow is such a great pop of color! Just goes to show you that you don't need a huge budget to have a beautiful party. How clever - love how beautiful these simple arrangements are. Will have to keep this in mind for our next fundraiser event. They turned out darling! The ladies must have been thrilled to receive such a darling bouquet. I love the yellow with the blue. I'll bet you were just delighted when you saw those strawberry boxes! So clever.........and love how you mixed the colours for high impact on a low floral budget. Makes me want to do a bunch for all over the house today. Thank you for your sweet comment on my blog! Your posies look really lovely!! They don't look 'low budget' at all! Your customer must have been pleased. Annie these are amazingly gorgeous. Wow, the colours and the arrangements are just perfect. I am loving this fabulous post. Would you mind sharing this inspirational post at our WIW linky party. Hope to see you there! love the turquoise boxes too! Wonderful display for these beautiful yellow compositons! Oh my gosh, Annie, these flower arrangements are wonderful. I love the sunny yellow flowers, and the IKEA glasses you used were perfect. Thanks for the great idea for the rubberband/raffia fix - definitely going to use that trick somewhere down the line! You certainly are a woman of many talents Anniie, these arrangemts are stunning!! Like everything, they look amazing in front of your signature blackboard too..! You indeed are a truly talented woman. I love your vase choice and you arrangements fit perfectly. I loved yout blog! I`m from Brazil!! see you..